Increase is a resident of the Retirement Castle. 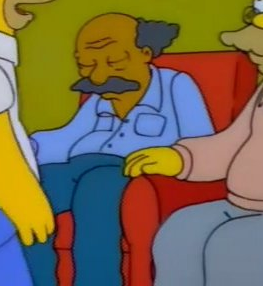 Homer knew him after a while living in the retirement castle. He was seen sleeping. Increase went with the other senior citizens because they were sick of the kids and adults keeping them awake. They then voted for a curfew for everyone under the age of 70, which passed. Increase was then seen out in the street, trying to get the can with his pills back. For the end credits of "Wild Barts Can't Be Broken", Hank Azaria recorded lines for Increase complaining about Jasper and Hans Moleman kicking a can of his pills. His voice is identical to Old Jewish man. Modified on April 6, 2018, at 12:53.